Greetings from Mulberry Street! We are open 7 days days a week in the heart of Little Italy. One of a kind items from around the world! 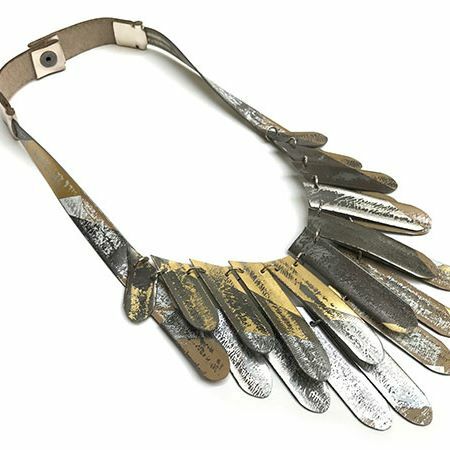 Please welcome Uli Rapp – Uli Rapp (1974) received her Masters degree in jewelry design at the prestigious Sandberg Institute in Amsterdam. Fascinated by the Elizabethan splendour in dress decoration she translates it into wearable contemporary jewelry. Her collections have developed rapidly in a sophisticated style and use of smart materials – she invented a technique to apply medical plastic between textile. 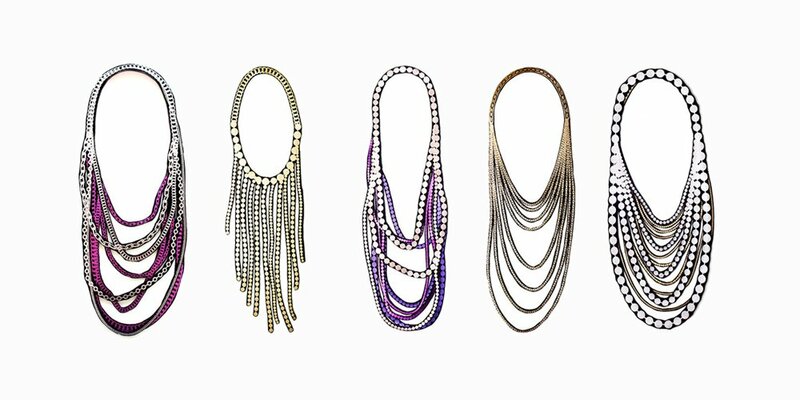 Uli’s necklaces, brooches and earrings interpret a love for antique gemstones and pearls contrasting with chunky chains. All pieces are skilfully handmade in screen print on light weight soft materials. 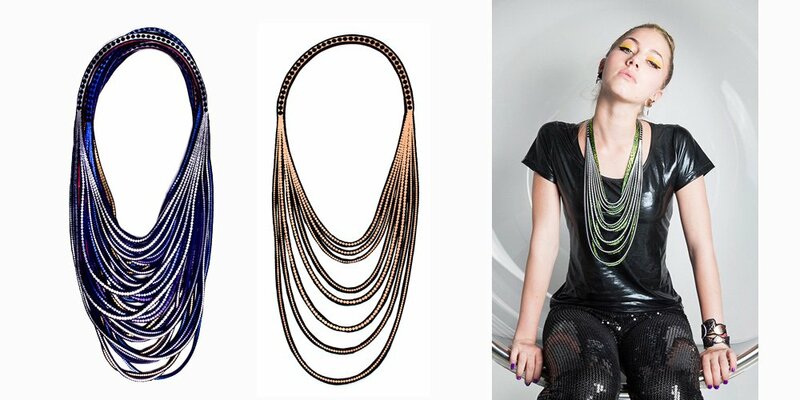 The combination of a contemporary artist’s tools with the hint of past splendour makes for tintillating jewelry: conversation pieces for bold wearers like famous Architect Zaha Hadid and Designer Nathalie Rykiel. Uliʼs pieces are in permanent collections of international museums and private collectors. They are sold at shows and galleries in Paris, Miami and Dubai. Mulberry Pop-Up has one of a kind pieces, as well as collections arriving weekly. Our L.A. collections are a sweet treat! This entry was posted in Real NYC Market and tagged Amsterdam, argentina, art, birds, chains, contemporary jewelry, design, fashion, galleries, gemstones, hand-felted, international museums, jewelry design, L.A. Collections, made in italy, medical plastic, merino wool, Mulberry Pop-Up, mulberry street, one of a kind, pearls, private colloectors, real nyc market, sandberg institute, screen print, silk, sophisticated, style, textile, Uli Rapp on November 25, 2017 by RealNYC. This entry was posted in Real NYC Market and tagged design, fashion, fashionista, mercedes, mercedes-benz, mercedes-benz fashion week, nyc, september 4 - 11, spring, Spring Summer 2015, style, summer on September 2, 2014 by RealNYC. Thank you Brenda of Fashionista Tea for your Blog! Tea Scarf and Fashionista Tea are awesome! There are so many artists and makers who come to the Real NYC Designer Market and make friends/connections with their next door neighbor! You never know who you will meet…. Keep your minds and hearts open and the right person will be dropped into your path! We are inspired – REAL brings so much talent together and so many ideas all under one roof (and sky)! “Recently, FashionistaTea was an exhibitor at the Real NYC Designer Market in the Nolita neighborhood of New York City. The Market features handmade décor, fashion, leather work, jewelry and all kinds of accessories. I had the opportunity to meet, Artist Reed Slater who was exhibiting beautiful scarves made from Tea. How could I not love this, fashion that is eco-friendly and the perfect combination of Tea and fashion! This entry was posted in Real NYC Market and tagged accesoories, bamboo, bamboo fiber, brooklyn, design, eco-friendly, fabric, fair trade, fall, fashion, fashionista tea, handmade, home decor, jewelry, leather work, luxury scarves, new york, organic, organic dye, organic tea, pattern, photographed, printed on paper, real designer market, real nyc designer market, real nyc market, reed slater, scarves, style, summer, sustainable, tea scarves, teascarf, unique, wearable art on July 15, 2014 by RealNYC. Thank you to all of our service people who have done time for our country. Thank you to the mom’s and dad’s who have supported their families and to all of the husbands and wives who have given up their time to do service. We thank everyone and everybody today – we thank you all for your service, time and honor. This entry was posted in Real NYC Market and tagged art market, authentic, authentic design, box 185 by sara keiser, buy local, clothing, design, design market, fashion, honor, khh, little italy, live music, market life, market on mulberry street, markets of new york, memorial day, memorial day weekend, musician, nolita, nuna knits, nyc fashion, nycstyle, original, peggie ehlers, qetia, real arts, real connections, real designer market, real maker, real music, real nyc designer market, salt + stone, sara keiser, shop loca, shop local, style, thank you, u r forever, urforever on May 28, 2014 by RealNYC.